As British police launched a murder investigation into the poisoning and death of Dawn Sturgess, 44, in Amesbury, various self-styled chemical weapons experts on Twitter have cried for Russia’s blood, squarely blaming Moscow for the incident yet in the early stages of the investigation. Mike Gapes, the Labour and Co-operative MP for Ilford South who recently got some limelight by urging British parliamentarians against providing any commentary to RT, immediately named Russia as a party responsible for Sturgess’ death. “This was a murder of a British citizen as a result of use of a chemical nerve agent produced by the Russian state,” Gapes wrote on Twitter, voicing something even Theresa ‘highly likely’ May has yet been wary of saying. Gapes’ vitriol was joined by Kremlin watchers from UK establishment media, Russia correspondent for The Telegraph Alec Luhn, and The Guardian’s Luke Harding. 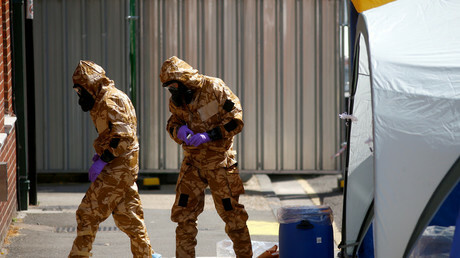 Harding, a well-known critic of the Russian government, implied that Sturgess was “collateral damage” of the Kremlin-orchestrated operation that was the poisoning of former double agent Sergei Skripal and his daughter Yulia in March in Salisbury. “Dawn Sturgess dies after exposure to #novichok. The circumstances unclear. An utter indifference to collateral damage one of the hallmarks of the #Putin regime and its extra-territorial operations,” he tweeted. Alec Luhn, another high-profile Russia critic, has used Sturgess’ death to defy Russian President Vladimir Putin, who, commenting on the Skripals poisoning, said that if the father and daughter were indeed attacked by a military-grade toxic agent they would not have survived. Putin’s remark, according to Luhn’s logic, somehow gives more credibility to the version that it was Moscow behind the Salisbury poisoning. “Vladimir Putin previously argued that the Russian state couldn’t have used a military nerve agent in the UK because the victims would have died. Now one of them has,” Luhn wrote. “Putin is a murderer. What are the odds Trump doesn’t bring this up next week. Putin is our ENEMY!! !” Brian Krassenstein, an editor at Hill Reporter with nearly 500,000 Twitter followers, wrote. Far from everyone was convinced by the allegations of Russian involvement, which is still based entirely on speculation, as it’s unclear at this stage how Sturgess came into contact with the substance. Moreover, neither Sturgess nor her partner Charlie Rowley, 45, who remains in critical condition in the hospital, have nothing in their background to suggest they might be of interest to the Kremlin, police said. However, when faced with backlash (or, indeed, legitimate questions) over his tweet, Gapes preferred to label anyone asking for evidence or doubting Russia’s guilt “Kremlin bots” and “squawking abusive trolls” from Russia.